Game, set, match…PANIC! The Match Panic app for the iPhone and iPod Touch is deceptively simple, but a crazy amount of fun. It is one of those games that will surprise you. Requiring all of two seconds to learn, it is the kind of game that everyone can play, but once you get going, you may not be able to put it down. Trust me, I’m really not kidding about the simple gameplay. 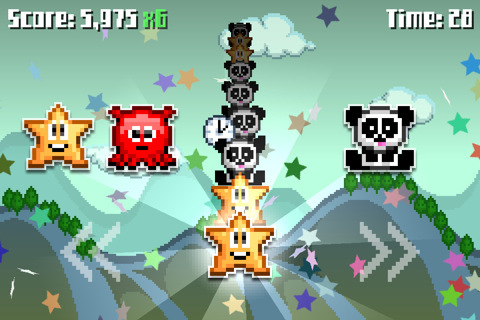 You start with a line of cheery pixel sprites running along the center of the screen. On either side are matching sprites. All you have to do is tap the side of the screen that matches whatever sprite is displayed in the middle. The next sprite in line pops up and then it’s lather, rinse, repeat. I know, I know, it sounds so basic as to be almost stupid, but it’s harder than you think. There are no lives to lose, so you’re free to make mistakes, but you do have to beat the clock, and too many mistakes will cost you valuable seconds. As you get going, each level becomes a frantic race against your brain to keep up with your fingers. You start with two sprites, but as you progress, new sprites are introduced, so you might end up with three different sprites on one side and two on another, but the basic controls (tap left or tap right) remain the same, and you just have to keep track which side is which. Clearly speed counts in a game like this, but accuracy does too to a lesser degree. 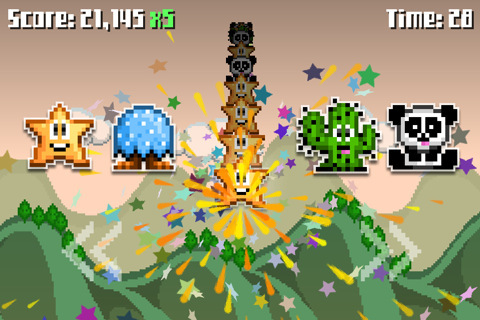 There is a score bonus for perfect games, and later levels introduce power-ups that you can activate if you manage to nail those matches on the first try: bombs that blow up a chunk of your match line, clocks to give you extra time, or special sparkly matches that will change a chunk of the line to all the same sprite. Adding even more to the game is its awesome retro appeal, thanks to a rocking old school chiptune soundtrack and fun sprites that have all the cheesy, delightful pixel charm of classic games, like Bubble Bobble. Game Center integration means that there are plenty of bragging rights to go around for the fastest matchers, but there are also a number of different achievements to chase down. Even though it’s an ideal game for killing a few spare minutes, you could easily play this one for hours and hours trying to chase down all of the achievements and battle it out on the high score tables. This makes for a lot of ready online competition, but this is also the kind of game that you’ll have a blast whipping out at parties and having your friends compete at. It’s not really designed for any kind of pass-and-play, but a 2-year old could play this game with minimal coaching, and so could an 85-year old, and that’s the real beauty of the game: fun, simple, family-friendly entertainment that you can play over and over and over again. AppSafari review of Match Panic was written by Tracy Yonemoto on July 12th, 2011 and categorized under Action, App Store, Fun, Games, Puzzler. Page viewed 4229 times, 1 so far today. Need help on using these apps? Please read the Help Page.